Figured may as well have a pic of my other Amstrad CPC style game here. 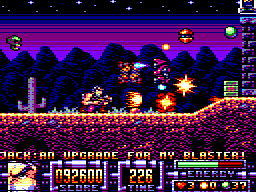 This uses the blockier but more colorful Mode 0 resolution of the CPC. There's a buggy demo (that I had to rush at the last minute for the Retro Remakes contest it was created for) on the net somewhere though I haven't made it available on my website due it's bugginess. I'll release a fixed demo at some point soon. In the meantime here's an old but not commonly seen screenshot from Level 3.